The influence that a legendary surname wields can be enormous. The influence that a legendary surname wields can be enormous. It can make even the most prudent and unbiased suspend their judgement and give in to a moment of idolatry thanksgiving. The following story from a selection committee could be illustrative. In 2004, the panel of selectors met to select the one-day team to play in Australia. One of the names that cropped up was of Rohan Gavaskar, son of arguably the world’s finest opener ever. Rohan was a good cricketer, doing his bit for Bengal in first-class cricket, but no one had imagined he would be picked to play for the country. He was. The choice was unanimous. No, his father, Sunil Gavaskar had wielded no influence and had not lobbied for his son’s inclusion. It was just that all the five selectors were such big fans of the great batsman and in their heart of hearts felt so indebted to him for what he had achieved for the country, that they did not oppose his son’s inclusion. In fact, as one of the selectors told me, they felt happy for having done their bit. Today, an even greater name in Indian cricket for almost similar reasons, is in the news. 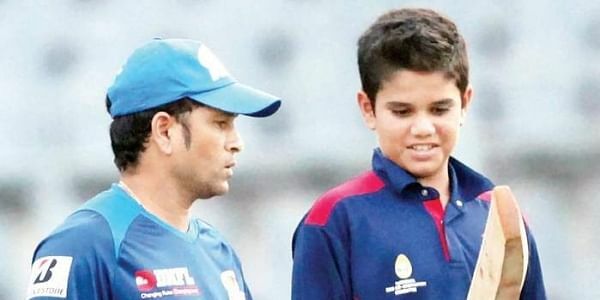 Arjun Tendulkar’s selection to the Indian under-19 team has been widely reported and dissected. Performances so far do not suggest that Sachin’s son is a child prodigy. In a cricketing world where staggering statistical feats are becoming very common, Arjun’s CV in comparison is very modest. This in no way indicates whether he has the talent to make it at international level or not. At 18, any achievement can be illusory. More important is the promise a player shows and the belief of those who evaluate, in that promise. By all indications, Arjun fulfils this criterion and anyone who has seen him play, believes he is a left-arm seamer who deserves to be groomed. Unfortunately for the young man, he has a surname that could haunt him for all times to come. At his age, his father Sachin was already being talked about worldwide as potentially one of the greatest ever. Many thought that Sachin’s selection to the Indian team, even though he was 16-plus then, had been delayed by a year. He deserved to be there much earlier, so great was his talent. His son at 18 has only been selected for the junior Indian team and the debate whether he is deserving or not has already started. It is a kind of pressure that can be debilitating on a young mind. No wonder, father Sachin, aware of what havoc pressure can play, had once issued a public appeal to keep his son away from unnecessary limelight. The power of the Tendulkar surname may have the potential to make a career, but in a field where the ultimate barometer of success is performance, it finally does not count for much. Arjun, like most youngsters out there, would be dreaming of doing well in the profession he has chosen. But unlike others, he has been burdened with a legacy which would be hard, if not near impossible, to carry forward. This is a legacy which can give him access but not a sense of belonging. Arjun’s path is not easy. He will have to strive to be accepted on his own terms. He will have to continuously be resisting a world which will keep reminding him of his father’s achievements. Does anyone fancy being in his shoes? Certainly not me and that is why I empathise with him and wish him all the best.